Week 10: Collezione D’Arte Religiosa Moderna. From Michelangelo to Modern Art in the Vatican. The decision of Pope Paul VI to call on modern artists to paint religious themes in 1973 for the Vatican probably has nothing to do with the debate raging between art critics about the appropriateness of religious subject matter in modern art- see below. Instead, it reflected a re-statement of the tradition in which artists worked with the Vatican. On June 23rd, 1973, Pope Paul inaugurated the collection of religious modern art with these words: “prodigious capacity for expressing, besides the human, the religious, the divine, the Christian.” This collection, consisting of gifts from modern artists and collectors, now numbers more than 500 works of art, signed by 250 artists on display in 55 rooms in the Papal Palace. As Mario Ferrazza recounts, the opening of the museum in 1973 can be traced back to a meeting between Paul VI and a group of modern artists in the Sistine Chapel on May 7th, 1964. Under the glory of Michelangelo’s ceiling, the pope reaffirmed the link between artists and the Vatican. This was a relationship that perhaps reached its apex when Julius II called on the genius of Michelangelo, Raphael and others to decorate the pontifical palace, resuscitated again during the age of the high baroque when Bernini served the Barberini. Paul claimed that this connection had weakened over the years, and the time was right to revive it; to clarify the importance of art for the Roman Catholic Church. He addressed the foregathering of artists in these words. “We must again become allies. We must ask of you the possibilities which the Lord has given you and therefore, within the limits of the functionality and the finality which form a fraternal link between art and the worship of God, we must leave to your voices the free and powerful chant of which you are capable.” The pope’s plea was answered by a positive response from artists, art collectors, corporations (both public and private), and various national committees, all of which was coordinated by Monsignor Pasquale Macchi, the pope’s private secretary. Organization of the Vatican Modern Art Collection. Giorgio de Chirico, Christ and the Storm, 1945, oil on canvas, dimensions not known, Collezione D’Arte Religiosa Moderna. Finding space to house this flood of modern art proved a problem, not least because the Vatican’s Pinacoteca already contained examples of modern art, gifts from the Holy See. The contemporary art section had been inaugurated in 1960 during the papacy of John XXIII (1958-63), the result of an initiative by Pius XIII (1939-58). Added to this collection were works from Pont-Aven, given by Abbot Pierre Tuarze in 1963 and 1964. Organizing the modern art collection fell to Professor Dandolo Bellini, Honorary Inspector for Contemporary Religious Art. The main problem confronting Bellini was the lack of space at the Vatican, a fact that would impact on how it would be organised. Limitations of space meant that there could be no chronological hang or display. Also, Pope Paul gave specific instructions that the collection would offer “a panorama of today’s art in relation to its capacity to express religious sentiment.” To bring the attention of interested parties to the collection, a programme of exhibitions and seminars was launched. Artists helped to stage such events as “Evangelization and Art” (1974), a review focused on the face of Christ, Exhibitions included “St Paul in Contemporary Art” (1977), and “Witness of the Spirit” (1979), both in homage to Pope Paul’s 80th year. Other initiatives included exhibitions on such themes as “The Influence of Spiritual Inspiration on American Art,” (1976). Such events were held with the help of the Friends of American Art in Religion, a cultural society headed by Cardinal Cooke. It was Cooke who negotiated between Pope John Paul II and the Metropolitan Museum for the exhibition on the Vatican Collections, the topic of our course. A problem with identifying sacred art in the twentieth century was that most critics believed that a real tradition of religious art was absent, a view perpetuated by Marxist writers such as John Berger, who completely refused to see any evidence of true religious feeling in the art of the twentieth-century, and indeed beyond. Instead, Berger renounced the religious in the `age of mechanical reproduction', and argued instead that the art object is enveloped in an atmosphere of entirely “bogus religiosity.” Berger particularly reserved his ire for language that characterised art of the twentieth-century as pietistic, sacred, and almost on a par with ‘holy relics’, paintings canonised in all senses of the term by art historians wishing to preserve their cultural status. Reading Berger, it becomes clear that what he considered religion was purely mysticism, a form of modern shamanism, which as a card-carrying Marxist he found objectionable. However, as another art historian has quite rightly pointed out in a recent discussion on the relevance of the theological to the modernist era, artists such as Malevich, whose Black Square could be regarded as the `ground zero' for modern art, went on to explore the iconography of the Cross and the Crucifixion, and there are many more who followed in Malevich's footsteps. In an interview the modern artist Bill Viola stated that Christians do not own the Resurrection or the Crucifixion, and that the image of Christ the saviour belongs to the whole world. Such universalism reflects the postmodern condition which we now supposedly inhabit, characterised by the collapse of `grand narratives' such as the Christian story, and the erosion in importance of the Bible itself. Viola’s remarks remind us of such religious anomalies as last week’s crucifix from the Congo that was also a representation of a tutelary spirit, despite its origin as an archetypal Christian symbol. Though it could be argued that modern art is an equally strange setting for Christian themes, it doesn’t follow that the `theological' dimension of modern and contemporary art is irrelevant; some believe that it needs to be reclaimed, and made the subject of a more searching inquiry than Berger's, which sought to expunge it. Pope Francis, Christianity and the Modern Artist. These two statements, the first by a Dutch art historian and the second by a French philosopher, demonstrate two opposing views on religion and art. For Rookmaaker, Christianity contains positive values, and possibilities for introducing a new set of aesthetic beliefs linked to the mystery of God. Rookmaaker sees these new ideas compatible with the aims of modern art, unlike John Berger who dismissed any kind of mysticism in twentieth century art. 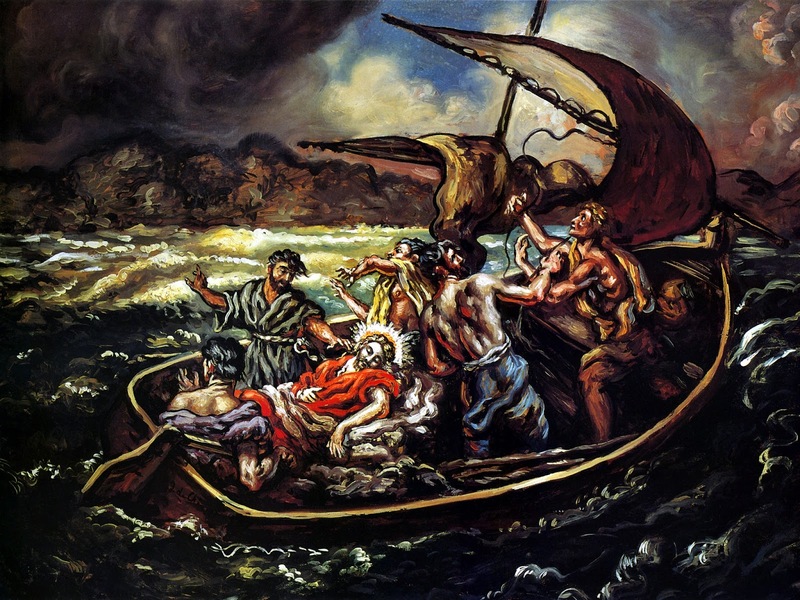 Representing the opposite view, the French philosopher Gilles Deleuze sees the emergence of what he calls “pictorial atheism” by which he seems to mean a liberating effect in painting once it has been released from the shackles of religious meaning and symbolism, a trend he follows from El Greco to Francis Bacon. According to this philosopher “pictorial atheism” creates painterly effects, not religious messages: Bacon’s crucifixions provide the space in which the painter can explore many themes and variations in his painting practice. What emerges from reading Rookmaaker and Deleuze is the question of whether painting can truly be atheistic at all. Surely painting, even modern art, depends upon an appeal to something external, whether it be God, humanism, or even science. Even rational thinkers like Descartes and Newton acknowledged the presence of a divine presence. As Voltaire states, “Newton and Locke, both worshippers of the Divinity from thorough examination and conviction”! With the ascension of a new pope who is willing to reflect tolerantly on atheists and non-believers, these issues can only become more relevant. 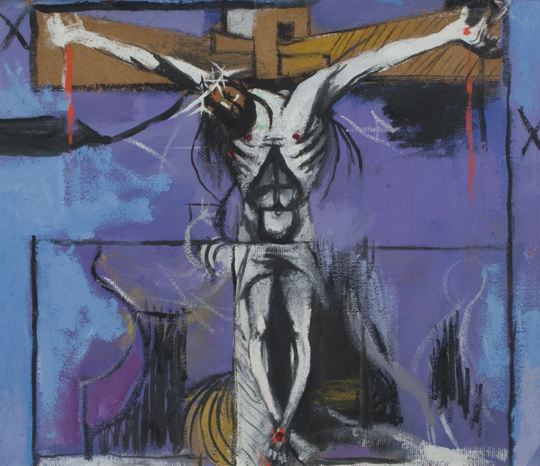 Pope Francis is a progressive pontiff who clearly takes an active interest in modern art, such as Marc Chagall’s White Crucifixion in Chicago. Nobody knows why Pope Francis is interested in a modern artist like Chagall, but surely it’s a good sign that he is. 1) Photo of Pope Paul VI. 2) View of Michelangelo’s ceiling in the Sistine Chapel. 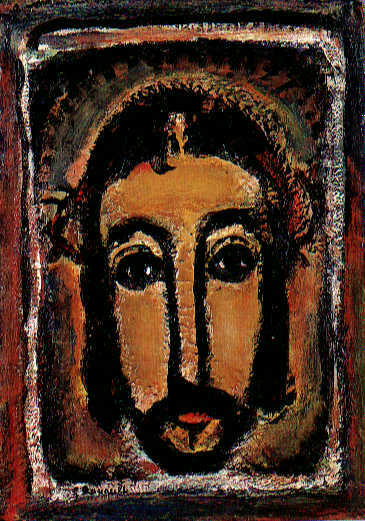 4) Georges Rouault (1871-1958), The Holy Face, c. 1946, oil on cardboard, height 20 1/8 (51 cm) x 14 9/16, signed lower left, Collezione D’Arte Religiosa Moderna. Born in 1871, pupil of Gustave Moreau who predicted that R’s strange technique would isolate him. R was described as “the only Christian who has realized in his painting the drama of our times.” Started this series in 1912, and this is one of his last versions. Note the impasto which lends a plasticity to the work. From 1937 on, R virtually stopped dating his art, although he collected newspaper clippings about himself. In 1917 the art dealer Amroise VOllard bought up all of R’s art, although after the dealer’s death R would successfully sue and recover them, of which 315 he burnt. 5) Andre Derain, The Church at Carrières Saint-Denis, 1909, oil on canvas, height 34 5/8 (88 cm) x 45 11/16 (116 cm), signed lower right, Collezione D’Arte Religiosa Moderna. Notes. Break with Fauvism- start of Cubist experiment-later abandoned to reclaim French classical tradition- During the summer of 1909 Derain stayed with Braques at C St Denis- influenced by Cezanne- geometric architecture and chastened palette- mme derain indicated this picture had been painted in this location. Derain was born in 1880 in Chatou, Yvelines, Île-de-France, just outside Paris. In 1898, while studying to be an engineer at the Académie Camillo, he attended painting classes under Eugène Carrière, and there met Matisse. In 1900, he met and shared a studio with Maurice de Vlaminck and began to paint his first landscapes. His studies were interrupted from 1901 to 1904 when he was conscripted into the French army. Following his release from service, Matisse persuaded Derain's parents to allow him to abandon his engineering career and devote himself solely to painting; subsequently Derain attended the Académie Julian. 6) Henri Matisse (1869-1954), The Tree of Life, 1949, cut and painted paper on cardboard, c. 17 ft (512 cm) x 8 ft ( 252 cm), unsigned, Collezione D’Arte Religiosa Moderna. Maquette for chapel of rosary (Vence); large sheet of paper covered with 3 layers of gouache (lemon yellow, light green, ultramarine); cut free-form floral motifs, then assembled and placed on separate piece of paper. Matisse declared it his masterpiece when the chapel was consecrated in 1951. 7) Carlo Carra (1881-1966), The Daughters of Lot, 1940, oil on canvas, Collezione D’Arte Religiosa Moderna, 31 ½ inches (80 cm) x 23 3/8 (60 cm). s/d lower left. Third rendering of theme- shift in colour tones without abandoning classical order- subject first confro9nted by carra in 1919 after a metaphysical experience.- second version destroyed by the artist in 1926, though an engraving of it still exists. Carlo Carrà (February 11, 1881 – April 13, 1966) was an Italian painter, a leading figure of the Futurist movement that flourished in Italy during the beginning of the 20th century. In addition to his many paintings, he wrote a number of books concerning art. He taught for many years in the city of Milan. arrà's Futurist phase ended around the time World War I began. His work, while still using some Futurist concepts, began to deal more clearly with form and stillness, rather than motion and feeling. Carrà soon began creating still lifes in a style he, along with Giorgio de Chirico, called "metaphysical painting". Throughout the 1920s and 1930s, the metaphysical phase gave way to a sombre style akin to Masaccio's. An example from this period is his 1928 Morning by the Sea.He is best known for his 1911 futurist work, The Funeral of the Anarchist Galli. Carrà was indeed an anarchist as a young man but, along with many other Futurists, later held more reactionary political views, becoming ultra-nationalist and irredentist before and during the war, as well as by Fascism after 1918 (in the 1930s, Carrà signed a manifesto in which called for support of the state ideology through art). The Strapaese group he joined, founded by Giorgio Morandi, was strongly influenced by fascism and responded to the neo-classical guidelines which had been set by the regime after 1937 (but was opposed to the ideological drive towards strong centralism).He died in Milan in 1966. 8) Giorgio de Chirico, Christ and the Storm, 1945, oil on canvas, dimensions not known, Collezione D’Arte Religiosa Moderna. 9) Otto Dix, Christ and Veronica, 1943, oil on panel, height 31 7/8 (81 cm) x 39 1/8 (100 cm), signed with a monogramme lower right, Collezione D’Arte Religiosa Moderna. Notes- “Christian mysticism” period 1940-6 in which the the painter developed the themes of beauty and sweetness-these were suggested in earlier paintings like his mother and child, and then the Madonna- lesser violence and drama led critics to argue that dix’s moral commitment had weakened- but the picture is still thought to convey moral condemnation at a society that watches suffering from the sidelines. Wilhelm Heinrich Otto Dix (German: [ˈvɪlhɛlm ˈhaɪnʁiç ˈɔto ˈdɪks]; 2 December 1891 – 25 July 1969) was a German painter and printmaker, noted for his ruthless and harshly realistic depictions of Weimar society and the brutality of war. Along with George Grosz, he is widely considered one of the most important artists of the Neue Sachlichkeit. 10) Dix painting in situ. 11) Graham Sutherland, Study for the Crucifixion, 1947, oil on Masonite, height 40 3/16 (102 cm) x 48 1/16 (122 cm), Collezione D’Arte Religiosa Moderna. Notes.1 years after Northampton version comm by canon Hussey in 1944- When asked why chosen the theme of the Crucifixion, S replied “ Because it is the most tragic of themes, and at the same time the only one that carries the promise of salvation- 6 interpretations of the subject- tragedy and pathos hark back to the renaissance, e.g. Grunewald’s version. 12) Graham Sutherland, The Crucifixion, St Matthew’s Church, Northampton, 1946, oil on canvas, 2.75m x 2.62m (9'x8'7") (framed). 13) Ottoni Rosai, Crucified Man, Collezione D’Arte Religiosa Modern. Notes: Ottone Rosai (Florence, 1895 – Ivrea (Turin), 1957) was an Italian painter. Rosai graduated from the Florence Academy of Fine Arts in 1912, a period in which he was closely associated with the Lacerba group of Florentine Futurists and especially Ardengo Soffici, with whom he held a joint exhibition at the Galleria Sprovieri, Rome, in 1914. Having returned to Florence after World War I, he adapted to the climate of the return to order and devoted himself to the study of early Italian painters. He held his first solo show at Palazzo Capponi in 1920, began contributing to the magazine Il Selvaggio in 1926 and took part in the Seconda Mostra del Novecento Italiano in Milan in 1929. Edoardo Persico organised a solo show of his work at the Galleria del Milione in 1930 and his participation in the Venice Biennale began by invitation with the 18th Esposizione Internazionale d’Arte della Città di Venezia in 1932. He obtained a teaching post at the Florence Academy of Fine Arts in 1942 and the Venice Biennale organised a large-scale retrospective of his work within the framework of the 28th Esposizione Internazionale d’Arte in 1956. 16) Mario Sironi, Christ and the Samaritan woman, 1947-48, oil on panel, height 22 1/16 x (56 cm) x 27 9/16 (70 cm), signed lower right, Collezione D’Arte Religiosa Moderna. Baptism symbolism- two figures seated at the well in the Oriental position- emphasis on light aiding feeling of intimacy- sironi’s approach linked with religious art that came out of world war 2. Mario Sironi (May 12, 1885 – August 13, 1961) was an Italian modernist artist who was active as a painter, sculptor, illustrator, and designer. His typically somber paintings are characterized by massive, immobile forms. He was born in Sassari on the island of Sardinia. His father was an engineer; his maternal grandfather was the architect and sculptor Ignazio Villa. Sironi spent his childhood in Rome. He embarked on the study of engineering at the University of Rome but quit after a nervous breakdown in 1903, one of many severe depressions that would recur throughout his life. Thereafter he decided to study painting, and began attending the Scuola Libera del Nudo at the Accademia di Belle Arti di Roma. There he met Giacomo Balla, who became "his first real teacher". Sironi also met Gino Severini and Umberto Boccioni, and like them he began painting in a Divisionist style under the guidance of Balla. By 1913, Balla, Boccioni and Severini had developed a new style—Futurism—which Sironi also adopted for a brief time. As an artist closely identified with Fascism, Sironi's reputation declined dramatically in the post-World War II period. Embittered by the course of events, he had returned to easel painting in 1943, and worked in relative isolation. His withdrawal from society increased after the death of his daughter Rossana by suicide in 1948. The paintings of his later years sometimes approach abstraction, resembling assemblages of archaeological fragments, or juxtaposed sketches. He continued working until shortly before his death on August 13, 1961, in Milan. During his lifetime Sironi exhibited internationally. It is possible that the cellular style of his compositions exhibited in the US during the 1930s influenced WPA muralists. In the postwar years, Sironi fell from favor due to his earlier association with Fascism, and was accorded little attention from art historians. A revival of interest in Sironi's work began in the 1980s, when his work was featured in major exhibitions, notably Les Réalismes at the Centre Georges Pompidou (1981) and Italian Art in the Twentieth Century at the Royal Academy, London (1989). 17) Ben Shahn, Third Allegory,1955, watercolour and tempera on paper, mounted on Masonite, height 39 3/16 (39.5 cm) x 25 1/8 (64.5 cm), signed lower right, Collezione D’Arte Religiosa Moderna. Notes. Symbolism of man’s terror in front of the flames (chimerical beast)- death of four black children in a fire in Chicago- references to artist’s early childhood spent in Lithuania, and his attachment to Hebraic themes- redesigning the letters of the alphabet- mosaic mural for jewish community in Maryland. Ben Shahn (September 12, 1898 – March 14, 1969) was a Lithuanian-born American artist. He is best known for his works of social realism, his left-wing political views, and his series of lectures published as The Shape of Content. Ben Shahn’s social-realist vision informed his approach to art. Shahn’s examination of the status quo inspired his creative process. Although he often explored polemic themes of modern urban life, organized labor, immigration and injustice, he did so while maintaining a compassionate tone. Shahn identified himself as a communicative artist. He challenged the esoteric pretensions of art, which he believed disconnect artists’ and their work from the public. As an alternative, he proposed an intimate and mutually beneficial relationship between artist and audience.Shahn defended his choice to employ pictorial realities, rather than abstract forms. According to Shahn, known forms allow the artist “to discover new truths about man and to reaffirm that his life is significant.” References to allegory, the Jewish bible, humanistic content, childhood, science, music and the commonplace are other motifs Shahn draws upon to make the universal personal for his viewers. Wit, candor and sentimentality give his images poignancy. By evoking dynamism, Shahn intended to inspire social change. Shahn stressed that in art, as in life, the combination of opposing orders is vital for progress. His hope for a unity among the diverse peoples of the United States relates to his interest in fusing different visual vocabularies. 18) Giocomo Manzù, Adolescence, (Portrait of Francesca Blanc), 1940-41, bronze, height 38 1/8 (97 cm) x 15 3/14 (40 cm) x 22 7/8 (58 cm), signed, below the left foot, Collezione D’Arte Religiosa Moderna. Notes. Giacomo Manzù, pseudonym of Giacomo Manzoni (December 22, 1908 - January 17, 1991), was an Italian sculptor, communist, and Roman Catholic. Manzù was born at Bergamo, the son of a shoemaker. Other than a few evening art classes, he was self-taught in sculpture, although he later became a professor himself. He started working wood during his military service in the Veneto in 1928; later, after a short sojourn in Paris, he moved to Milan, where architect Giovanni Muzio commissioned him the decoration of the chapel of Università Cattolica del Sacro Cuore (1931–1932). In 1933 he exhibited a series of busts at the Triennale di Milano, which granted him national popularity. The following year he held in Rome a personal exhibition with the painter Aligi Sassu, with whom he shared a studio.In 1939 Manzù started a series of bronze bas-reliefs about the death of Jesus Christ; the works, exhibited in Rome in 1942, were criticized by the Fascist government and the ecclesiastical authorities. In 1940 he obtained a teaching position in the Accademia di Brera in Milan, but later he moved to the Accademia Albertina in Turin. During World War II Manzù moved to Clusone, returning to teach at Brera after the end of the conflict, a position he held until 1954. Until 1960 he lived in Salzburg. Here he met Inge Schabel, his future wife, who was the model of numerous portraits together with her sister Sonja. In 1964 he completed the "Death Gate" for the St. Peter's Basilica in Rome. In the same year he moved to Ardea, near Rome, in a locality now rechristened Colle Manzù in his honor.In the late 1960s Manzù started to work also as scenographer. In 1977 he completed a "Monument to the Partisan" in Bergamo. His last great work was the 6 m-tall sculpture facing the ONU seat in New York, inaugurated in 1989.He was the subject of a famous photographic portrait by Yousuf Karsh.His works are recognized by Western museums and collectors, while celebrated by the Soviet art world as well. A Roman Catholic, he was a personal friend of Pope John XXIII and had important liturgical commissions for the Vatican. In the United States, architect Minoru Yamasaki commissioned him for the Passo di Danza (dance step) sculptor at the One Woodward Avenue building in Detroit. He also carved the Nymph and Faun at Wayne State University's McGreagor Memorial sculpture garden.Manzù died in Rome in 1991.Pope Francis. 19) Vincent van Gogh (after Delacroix), Pietà , oil on canvas, Collezione D’Arte Religiosa Moderna The Delacroix lithograph La Pietà, as well as several others, fell into my oils and paints and was damaged. This upset me terribly, and I am now busy making a painting of it, as you will see. 20) Eugene Delacroix, Pietà, National Museum, Oslo, oil on canvas, 35 x 27 cm. In the beginning of the 1840s Delacroix made a mural in a Paris church depicting the deposition, with a group of people mourning over the deceased Jesus. In this 1850 oil painting he left out most of the characters, leaving only the corpse and the mourning Mary. The scene is commonly known as Pietà. The use of strong colours shows that Delacroix already painted in a less naturalistic style than at the start of his career. 21) Marc Chagall, Red Pieta, date unknown. 22) Red Pieta in situ. 23) Photo of Pope Francis. 24) Marc Chagall, White Crucifixion, 1938, Oil on canvas, 60 3/4 x 55 in. (154.3 x 139.7 cm), Signed and dated, l.r. : "MArc ChAgAll/ 1938", Chicago Institute of Fine Arts. 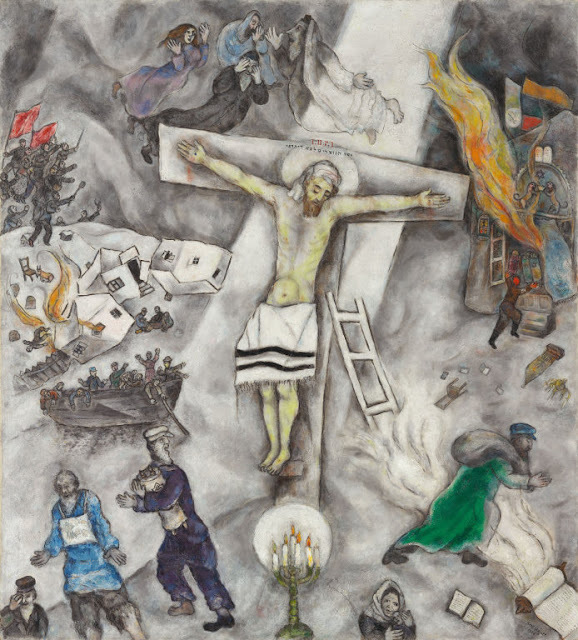 White Crucifixion represents a critical turning point for Marc Chagall: it was the first of an important series of compositions that feature the image of Christ as a Jewish martyr and dramatically call attention to the persecution and suffering of the Jews in 1930s Germany. In this painting, exhibited in January 1940 (four months after France’s entry into World War II), Chagall stressed Jesus’s Jewish identity by depicting him, along with the biblical patriarchs and matriarch above him, in traditional Jewish garments and surrounded by images of the devastation of pogroms. Linking the martyred Jesus with martyred Jews, and the Crucifixion with contemporary events, Chagall’s painting suggests that the Nazis, like Christ’s tormentors, were engaged in persecution and murder. The Vatican Collections: the Papacy and Art (New York, 1983), 242-3. John Berger, Ways of Seeing, (London, 1972), 23. David Packwood, “Saving Postmodernism’s Soul: Bill Viola’s The Passions”. Art Book, Vol. 11, no. 4, (2004), 8-10. H.R. Rookmaaker, Modern Art and the Death of a Culture (London, 1970), 228.